Otto F. Freuler was born on 16 July 1875 at Edgewood, Illinois. He was the son of Jacob Freuler and Barbara Ann Mollet. Otto F. Freuler married Augusta Josephine Kurrus on 6 October 1899. Otto F. Freuler died on 30 January 1934 at St. Louis, Missouri, at age 58. [S246] U.S. Federal Census 1880 U.S. Federal Census, by Ancestry.com, NA Film Number T9-0234. Page 515A. [S245] U.S. Federal Census 1900 U.S. Federal Census, by Ancestry.com, Year: 1900; Census Place: St Louis Ward 12, St Louis (Independent City), Missouri; Roll: T623_894; Page: 14A; Enumeration District: 182. [S244] U.S. Federal Census 1910 U.S. Federal Census, by Ancestry.com, Year: 1910; Census Place: St Louis Ward 13, Saint Louis City, Missouri; Roll: T624_817; Page: 7A; Enumeration District: 0466; Image: 190; FHL Number: 1374830. [S243] U.S. Federal Census 1920 U.S. Federal Census, by Ancestry.com, Year: 1920;Census Place: St Louis Ward 24, St Louis (Independent City), Missouri; Roll: T625_960; Page: 20B; Enumeration District: 480; Image: 599. [S250] U.S. Federal Census 1930 U.S. Federal Census, by Ancestry.com, ED96-167. Dwelling 320. Married Name January 1922 As of January 1922,her married name was Gillespie. Anna Barbara Freuler was born on 20 August 1877 at Highland, Madison, Illinois. She was the daughter of Jacob Freuler and Barbara Ann Mollet. Anna Barbara Freuler died on 29 May 1950 at Colorado Springs, Colorado, at age 72. She was buried after 29 May 1950 at Highland, Illinois. Anna Barbara Freuler had zero children. [S245] U.S. Federal Census 1900 U.S. Federal Census, by Ancestry.com, ED54. Dwelling 361. [S244] U.S. Federal Census 1910 U.S. Federal Census, by Ancestry.com, Year: 1910; Census Place: St Louis Ward 10, Saint Louis City, Missouri; Roll: T624_816; Page: 6B; Enumeration District: 0159; Image: 159; FHL Number: 1374829. [S243] U.S. Federal Census 1920 U.S. Federal Census, by Ancestry.com, ED187. Dwelling 187. Emma Freuler was born on 9 September 1879 at Illinois. As of 5 April 1930, Emma Freuler was never married. She died on 15 December 1969 at age 90 also reported as 23 Dec 1969. She was buried after 15 December 1969 at Highland City Cemetery, Highland, Illinois. Emma Freuler obtained US Social Security Card at Missouri; last residence Hermann, Gasconade, Missouri. [S250] U.S. Federal Census 1930 U.S. Federal Census, by Ancestry.com, ED37-14. Dwelling 62. Married Name 28 December 1897 As of 28 December 1897,her married name was Koranda. Mathilda Wilhelmina Winter was born on 14 November 1879 at Dakota Territory. She was the daughter of John Ludwig Winter and Josephine Mollet. Mathilda Wilhelmina Winter married Joseph Koranda, son of John Koranda and Mary (? ), on 28 December 1897 at Utica, Yankton, South Dakota. Mathilda Wilhelmina Winter died before 1954. [S246] U.S. Federal Census 1880 U.S. Federal Census, by Ancestry.com, NA Film Number T9-0115. Page 519A. ED110. Dwelling 106. [S245] U.S. Federal Census 1900 U.S. Federal Census, by Ancestry.com, ED347. Sheet 6B. Dwelling 107. [S243] U.S. Federal Census 1920 U.S. Federal Census, by Ancestry.com, ED257. Dwelling 46. [S250] U.S. Federal Census 1930 U.S. Federal Census, by Ancestry.com, ED56-7. Dwelling 82. [S9] South Dakota, South Dakota Birth Records South Dakota, State File Number: 576203 (unknown file date). Charles E. Nickey was born in March 1860 at Wisconsin also reported as Mar 1859. Charles E. Nickey was listed as a beneficiary in Abraham Nickey's will on 11 October 1872 at Sauk, Wisconsin. Charles E. Nickey married Anna L. Weir, daughter of Robert Weir and Emily Maude Newman Lintott, circa 1892. Charles E. Nickey died circa 1931. He was buried circa 1931 at Forest Home Cemetery, Milwaukee, Milwaukee, Wisconsin. 1 June 1905 Milwaukee, Milwaukee, Wisconsin He is listed as son on the census of 1 June 1905 in the household of Margareta Eve Kiefer at Milwaukee, Milwaukee, Wisconsin. [S246] U.S. Federal Census 1880 U.S. Federal Census, by Ancestry.com, NA Film Number T9-1446. Page 229A. ED261. Dwelling 6. [S244] U.S. Federal Census 1910 U.S. Federal Census, by Ancestry.com, ED172. Dwelling 36. [S250] U.S. Federal Census 1930 U.S. Federal Census, by Ancestry.com, Year: 1930; Census Place: Oakland, Alameda, California; Roll: 104; Page: 5A; Enumeration District: 0118; Image: 357.0; FHL microfilm: 2339839. Edwin J. Nickey was born in August 1866 at Wisconsin also reported as Aug 1867. Edwin J. Nickey was listed as a beneficiary in Abraham Nickey's will on 11 October 1872 at Sauk, Wisconsin. 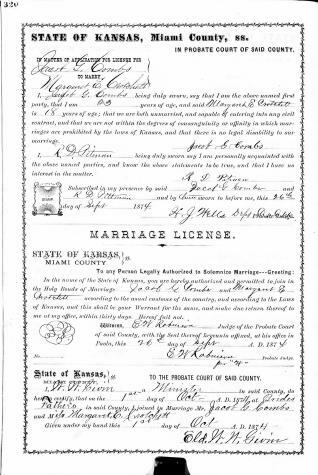 Edwin J. Nickey married Ann M. (?) circa 1914. Edwin J. Nickey died in 1934. He was buried in 1934 at Forest Home Cemetery, Milwaukee, Milwaukee, Wisconsin. 1 June 1905 Milwaukee, Milwaukee, Wisconsin Edwin J. Nickey is listed as son on the census of 1 June 1905 in the household of Margareta Eve Kiefer at Milwaukee, Milwaukee, Wisconsin. [S243] U.S. Federal Census 1920 U.S. Federal Census, by Ancestry.com, Year: 1920; Census Place: Milwaukee Ward 7, Milwaukee, Wisconsin; Roll: T625_1999; Page: 2B; Enumeration District: 89; Image: 671. [S250] U.S. Federal Census 1930 U.S. Federal Census, by Ancestry.com, Year: 1930; Census Place: Milwaukee, Milwaukee, Wisconsin; Roll: 2587; Page: 2A; Enumeration District: 88; Image: 731.0. Married Name 23 October 1895 As of 23 October 1895,her married name was Tabor. Minnie Ella Nickey was born in July 1869 at Wisconsin. She was the daughter of Abraham Nickey and Margareta Eve Kiefer. Minnie Ella Nickey was listed as a beneficiary in Abraham Nickey's will on 11 October 1872 at Sauk, Wisconsin. Minnie Ella Nickey married Irving C. Tabor, son of Samuel Irwin Freeborn and Elvina Clara Howe, on 23 October 1895 at Milwaukee, Wisconsin. Minnie Ella Nickey died in 1899. She was buried in 1899 at Oakwood Cemetery, Independence, Buchanan, Iowa. In February 1899 Irving Tabor and daughter Doroty are at Asheville, NC visiting Mrs Tabor. Mary H. Meade was born circa 1868 at Oregon. [S247] U.S. Federal Census 1870 U.S. Federal Census, by Ancestry.com, Page 13. Dwelling 87. Stamp 234. John Meade was born circa 1874 at Wisconsin. He was the son of Lewis S. Meade and Mary Elizabeth Worden. Name Variation Godfried Dorow was also known as Gottfried. Name Variation Godfried Dorow was also known as Godfry. Godfried Dorow was born in 1844 at Prussia. He married Wilhelamina Braun circa 1867. He died before June 1900. [S214] Wisconsin Sauk Co Cemetery Records Vol 9, page 59. Name Variation Wilhelamina Braun was also known as Whilemina. Name Variation Wilhelamina Braun was also known as Brown. Married Name circa 1867 As of circa 1867,her married name was Dorow. Wilhelamina Braun was born on 1 July 1842 at Hanover, Prussia. She married Godfried Dorow circa 1867. Wilhelamina Braun died on 31 January 1926 at Madison, Dane, Wisconsin, at age 83. 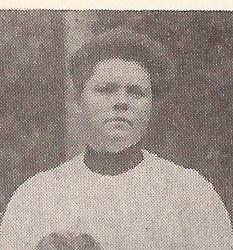 Wilhelamina Braun immigrated in 1867. She had 4 with 4 living in 1910 children. [S245] U.S. Federal Census 1900 U.S. Federal Census, by Ancestry.com, ED149. Dwelling 70. [S244] U.S. Federal Census 1910 U.S. Federal Census, by Ancestry.com, ED130. Dwelling 140. Married Name before 1900 As of before 1900,her married name was Gluth. Martha Dorow was born in 1869 at Wisconsin. She was the daughter of Godfried Dorow and Wilhelamina Braun. Martha Dorow married Charles Edward Gluth, son of Julius Gluth and Caroline Abraham, before 1900. Martha Dorow died on 8 April 1959. [S243] U.S. Federal Census 1920 U.S. Federal Census, by Ancestry.com, ED161. Dwelling 84. William M. Dorow was born on 25 March 1873 at Wisconsin also reported as 25 Mar 1872. William M. Dorow married Margaret Ellen Garvey, daughter of Francis Garvey and Bridget McCraw, on 13 October 1897. William M. Dorow died on 3 January 1970 at age 96. William M. DOROW, son of Godfried and Wilhelmina (BROWN) DOROW, was born March 25, 1878, Loganville, Wis; married Oct. 13, 1897, Margaret Ellen GARVEY, daughter of Francis and Bridget (McCRAW) GARVEY. She was born Dec. 23, 1880. They have four children: Francis, married Monica CARMODY; Margaret Cecelia, born Nov. 20, 1899, died Aug. 20, 1920; Mary Estella, born Nov. 1, 1902 - married Merton SULLIVAN of Chicago, and has one child, Margaret Dorow SULLIVAN, born Nov. 29, 1927; and Catherine Helen, born July 15, 1916, died March 6, 1918. [S245] U.S. Federal Census 1900 U.S. Federal Census, by Ancestry.com, ED149. Dwelling 71. Name Variation Fredrick Charles Dorow was also known as Charles Frederick. Name Variation Fredrick Charles Dorow was also known as Fred. Fredrick Charles Dorow was born on 19 January 1875 at Westfield, Sauk, Wisconsin. Fredrick Charles Dorow married Minna L. Gluth, daughter of Julius Gluth and Caroline Abraham, on 26 June 1901. Fredrick Charles Dorow died on 21 July 1932 at Madison, Dane, Wisconsin, at age 57 Charles Frederick Dorow was born to Gottfried and Whilemina Dorow, January 19, 1875, in the town of Westfield, Sauk County. He was married to Minnie L. Gluth June 26, 190l. To this union four children were born. He lived on the Dorow homestead all his life with the exception of two years when he lived at Reedsburg, but returned to the farm home in the year 1918. In the early dawn on the 2lst day of July, 1932 God summoned the life of Mr. Dorow who had been in failing health for over a period of three years suffering with pernicious anemia. On Friday, the 18th of July, he became seriously ill, complications developing and was confined to his bed. Monday, July 19th, he wished to be taken to the Wisconsin General Hospital at Madison. Both he and his family believing that such care would soon bring him home again with renewed strength. The end came as a great shock to his family and entire community. He leaves to mourn his loss his wife and four children, Erwin, Bennie, Lela and Violet besides one sister, Mrs. Charles Gluth and one brother, William Dorow of Reedsburg. His parents and one brother, Henry Dorow, preceded him in death several years ago. The funeral was conducted by Rev. Schneider who gave a scripture reading at the house and a prayer and Mr. Dorow's favorite hymn "In the Sweet Bye and Bye" was sung by Mrs. Lenard Zobel and Mr. Lund, ac companied at the organ by Miss Milda Schneider. At the church Rev. Schneider brought a comforting message from a well chosen chapter of St. John, chapter 10 v. 20, the singer again rendering the songs he loved to hear, "Rugged Cross". He body was laid to rest in the Greenwood cemetery . Sadly missed by his family but with a comforting thought in mind that we will meet in the Sweet Bye and Bye. Taken from the Reedsburg Paper of July 29, 1932. He was buried on 23 July 1932 at St John Lutheran Church, Reedsburg, Sauk, Wisconsin. [S364] Wisconsin State Census Wisconsin State Censuses, 1895 and 1905, by Ancestry.com, Dwelling 20. John Thomas married Sarah (?). Married Name Her married name was Thomas. Sarah (?) married John Thomas. George Magers married Mary Jane (?). Married Name Her married name was Magers. Mary Jane (?) married George Magers. Name Variation Donald Stanley Manville was also known as D. S.
Name Variation Donald Stanley Manville was also known as Pug. Donald Stanley Manville was born on 25 October 1931 at Sauk, Wisconsin. He was the son of Thomas Manville and Bessie Koska. 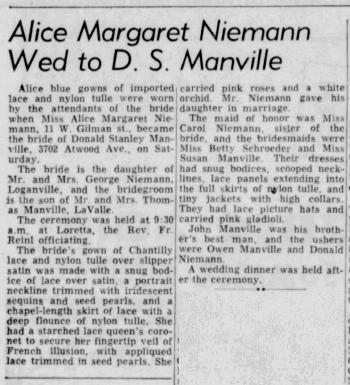 Donald Stanley Manville married Alice Margaret Niemann, daughter of George Arthur Niemann and Cecelia K. Hutter, on 14 May 1955 at Sauk, Wisconsin, Alice Margaret Niemann and D S Manville wedding announcement. Donald Stanley Manville died on 1 November 2009 at age 78 Donald "Pug" Manville, age 78, of Cazenovia, passed away on Sunday, Nov. 1, 2009. He was born on Oct. 25, 1931, in Sauk County, the son of Thomas and Bessie (Koska) Manville. 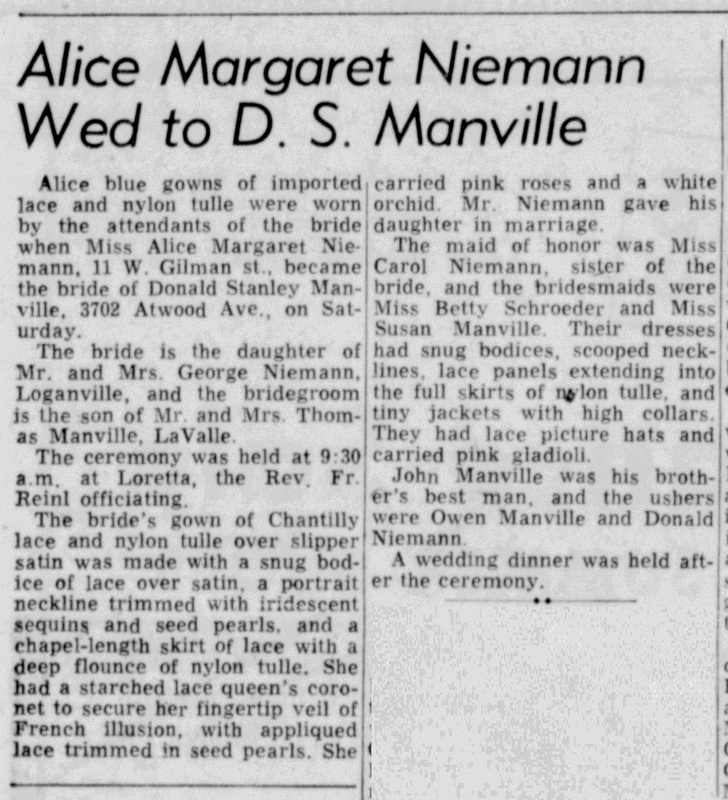 On May 14, 1955, he was united in marriage to Alice M. Niemann. This marriage was blessed with two children. After graduating from high school he joined the military where he proudly served his country in the U.S. Army during the Korean War. Pug owned and operated Manville's Bar with Alice from 1956-1981. He also worked for the Madison Police Department and as a guard for Badger Ordnance for 33 years. Donald served in the village of Cazenovia as mayor and on the village board for many years. He was a member of Cazenovia American Legion Post 491, and a member of 40 and 8. Don was also a member of St. Anthony's Catholic Church in Germantown. He enjoyed hunting, fishing, playing euchre, the outdoors and traveling. He is survived by his children, Sherry (Rodney) Lovell of Cazenovia, and Tim Manville and Pam of Loganville; grandchildren, Stephanie (Mike) Thorson of Eagan, Minn., Derrick Lovell (Mary) of Cazenovia, Bobbi Jo Manville of Florida, Nickolas Manville and Brianna Manville of Loganville; great-grandchild, Reese Thorson; brothers and sister, Larry (Agnes) Manville of Madison, Owen (Shirley) Manville of Ironton, and Sue Hissey of Cheyenne, Wyo; and numerous nieces, nephews, and other relatives and friends. Don was preceded in death by his wife, Alice; parents, Tom and Bessie Manville; and brother and sister-in-law, John "Jack" and Janet Manville. The Mass of Christian Burial for Donald "Pug" Manville will be conducted at 11 a.m., Friday, Nov. 6, 2009, at ST. ANTHONY'S CATHOLIC CHURCH in Cazenovia with Father Andre Panek and Father Lorin Bowens concelebrating. Burial will follow in Calvary Cemetery in Ironton with military graveside rites being conducted by the Cazenovia American Legion Post 491. Friends may call on Thursday, Nov. 5, 2009, from 4 p.m. - 8 p.m. at the CAZENOVIA CHAPEL with a rosary prayed at 8 p.m. The Farber Funeral Home in Reedsburg is assisting the family with the arrangements. He was buried after 1 November 2009 at Calvary Cemetery, Ironton, Sauk, Wisconsin. Donald Stanley Manville lived in January 2008 at 165 Hwy V, Cazenovia, Richland, Wisconsin. Name Variation David Gerard Niemann was also known as Dave. David Gerard Niemann was born on 28 August 1959. He was the son of Donald G. Niemann. David Gerard Niemann died on 21 June 2017 at age 57 David Gerard Niemann, age 57, of Beloit, formally of Plain, Wisconsin, passed away peacefully on Wednesday, June 21, 2017. He was born on August 28, 1959, in Madison, Wisconsin, son of Donald G. and Ruth A. (Neuheisel) Niemann. Dave was a 1977 graduate of River Valley High School, Spring Green, and a 1979 graduate of Madison Area Technical College with a degree in Welding. He will always be remembered as a kind and gentle man with a generous and compassionate heart. Dave always showed genuine interest in the lives of his family and friends. He had the gift to gab, always keeping conversations light with his humor. Dave was an avid sportsman who loved the outdoors. He enjoyed hunting, fishing and gardening. Being a loyal Green Bay Packers fan, he always enjoyed sharing and analyzing the details of the game with his mom. Dave was very proud of his two beloved daughters, Karah and Mallory, who were truly the light of his life. Dave is survived by his mother, Ruth, of Reedsburg, daughters, Karah and Mallory, brother, Dean (Trudy) Niemann, of North Freedom, and sister, Darla (Duane) Webber, of Reedsburg, Special Friend, Karla Knapp, of Janesville, and his faithful dog, Buddy, along with nieces, nephews and other relatives and friends. He was preceded in death by his father, Don. A Mass of Christian burial will take place Tuesday, June 27, 2017, at 11:30 a.m., at Sacred Heart Catholic Church. Father Scott Emerson will be the Celebrant. Visitation will also be on Tuesday at the church from 10:00 A.M. until the time of service. Burial will take place at St. Luke’s Cemetery in Plain. 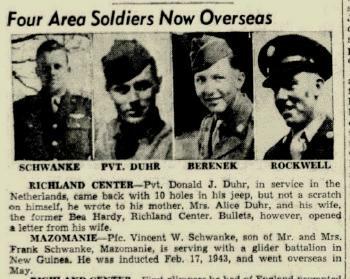 Name Variation Vincent Warren Schwanke was also known as Vince. Vincent Warren Schwanke was born on 16 November 1924 at Wisconsin. 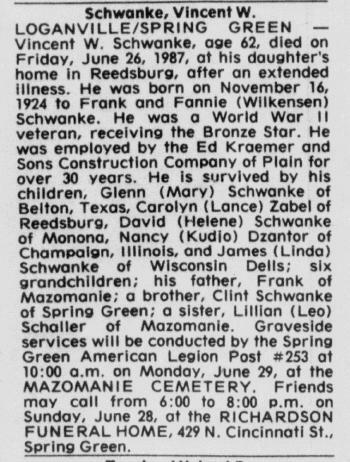 Vincent Warren Schwanke died on 26 June 1987 at Sauk, Wisconsin, at age 62 Vincent W Schwanke obituary. 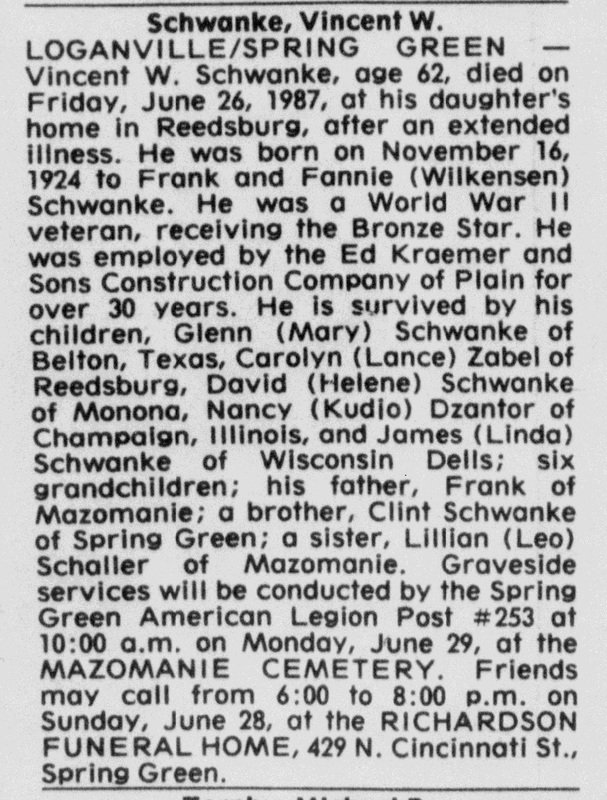 He was buried after 26 June 1987 at Mazomanie Cemetery, Mazomanie, Dane, Wisconsin. Weight: 144. In December 1944 Private Vincent Schwanke is serving with a glider battalion in New Guinea. Married Name 1 October 1874 As of 1 October 1874,her married name was Combs. Margaret Elizabeth Crotchett was born on 31 October 1855 at Red Bud, Randolph, Illinois, also reported as Pope county, IL. She was the daughter of Lorenzo Dow Crotchett and Elizabeth Christian Tanner. 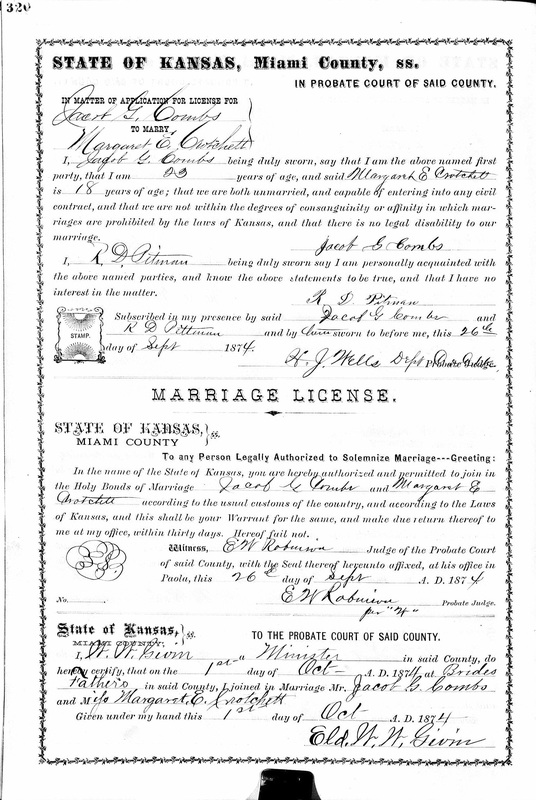 Margaret Elizabeth Crotchett married Jacob Gentry Combs, son of Jacob Noah Combs and Sarah Ann Vangundy, on 1 October 1874 at at bride's father's house, Miami, Kansas, Marriage record of Jacob G Combs and Margaret E Crotchett. [S246] U.S. Federal Census 1880 U.S. Federal Census, by Ancestry.com, NA Film Number T9-0387. Page 389D. ED260. Dwelling 199. [S243] U.S. Federal Census 1920 U.S. Federal Census, by Ancestry.com, ED69. Dwelling 104. Sheet 5A. [S250] U.S. Federal Census 1930 U.S. Federal Census, by Ancestry.com, ED12-45. Dwelling 16. Morrilton, Genealogy Crotchett --- Tanner, pg 39. Name Variation Marietta Combs was also known as Etta. Name Variation Marietta Combs was also known as Mary Etta. Married Name 5 July 1895 As of 5 July 1895,her married name was Carey. Married Name after 1940 As of after 1940,her married name was Stansberry. 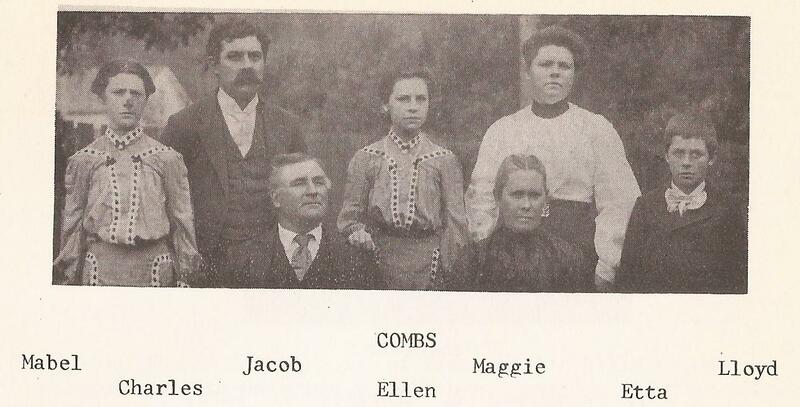 Marietta Combs was born on 18 October 1876 at Miami, Kansas. She was the daughter of Jacob Gentry Combs and Margaret Elizabeth Crotchett. 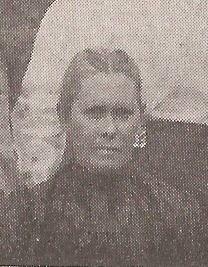 Marietta Combs married John Carey on 5 July 1895 at Santa Cruze, California. Marietta Combs and John Carey were divorced before April 1930. Marietta Combs married Nate Stansberry after 1940. Marietta Combs died on 9 December 1955 at Eureka, Humboldt, California, at age 79 Marietta Stansberry, 79, a Briceland resident, died Friday evening in a Eureka hospital. She was born October 18, 1876 in Louisburg, Kansas. She came to California 69 years ago, 52 years of this time being spent as a resident of Humboldt County. She had resided at Briceland for the past fifteen years. She is survived by her husband, Nate Stansberry of Briceland; the following sons and daughters: Ms. Crissola Sundquist, Eureka; Mrs. Marguerite Lockwood, Santa Rosa; Charles Carey, Redway; Mrs. Chlotilda McLean, Eureka; Mrs. Mabel Sain, Redding; Wayne Carey, Blue Lake; John and Clarence Stansberry, Willits; twenty-one grandchildren and thirty great-grandchildren also survive and a number of other relatives. She was buried after 9 December 1955 at Ocean View Cemetery, Eureka, Humboldt, California. [S243] U.S. Federal Census 1920 U.S. Federal Census, by Ancestry.com, ED71. Dwelling 82. Robert E. Richardson was born on 17 November 1924 at Spring Green, Sauk, Wisconsin. He was the son of Edward Calvin Richardson and Helen Doris Sherwood. Robert E. Richardson witnessed the death of Edward Calvin Richardson on 21 July 1940 at Spring Green, Sauk, Wisconsin; Edward C Richardson drowned in the Wisconsin river, while trying to save his son. Robert E. Richardson died on 9 February 1992 at age 67. [S250] U.S. Federal Census 1930 U.S. Federal Census, by Ancestry.com, ED56-35. Dwelling 135. [S373] U.S. Federal Census 1940 U.S. Federal Census, by Ancestry.com, Year: 1940; Census Place: Spring Green, Sauk, Wisconsin; Roll: T627_4523; Page: 1B; Enumeration District: 56-37. Name Variation Bradley Albert Richardson was also known as Bert. Bradley Albert Richardson was born on 28 October 1933 at Spring Green, Sauk, Wisconsin. Bradley Albert Richardson died on 15 July 1990 at Wisconsin at age 56. William Otho McDaniel married Minnie May Dorrough, daughter of John Thomas Dorrough and Mary Ella Christopher. William Otho McDaniel was born on 11 September 1886 at Smackover, Arkansas. He was the son of Robert Rush McDaniel and Anna Laura Peace. William Otho McDaniel died on 22 June 1960 at Blythe, California, at age 73. [S245] U.S. Federal Census 1900 U.S. Federal Census, by Ancestry.com, ED131. Dwelling 22. Name Variation Minnie May Dorrough was also known as Darrough. Married Name Her married name was McDaniel. Minnie May Dorrough married William Otho McDaniel, son of Robert Rush McDaniel and Anna Laura Peace. Minnie May Dorrough was born on 16 August 1891 at Maben, Mississippi. She was the daughter of John Thomas Dorrough and Mary Ella Christopher. Minnie May Dorrough died on 8 October 1979 at Visalia, California, at age 88. David Tanner McDaniel married Donie Mae (?). David Tanner McDaniel was born on 11 March 1888 at Arkansas. David Tanner McDaniel died on 16 April 1955 at Easterly, Robertson, Texas, at age 67. He was buried after 16 April 1955 at Easterly Cemetery, Robertson, Texas. Robert Roddy McDaniel married Esther (?). Robert Roddy McDaniel was born on 24 June 1891 at Texas also reported as Arkansas. Robert Roddy McDaniel died on 4 September 1953 at Jacksonville, Cherokee, Texas, at age 62. Henry Lykins married Martha Janie McDaniel, daughter of Robert Rush McDaniel and Anna Laura Peace, before October 1913.